Turquie d'Europe et Partie de Celle d'Asie divisee par grandes Provinces et Gouvernemts. A beautiful example of Janvier's 1783 decorative map of Turkey in europe. Janvier's map covers from Croatia and the boot of Italy eastward as far as the Crimea, the Black Sea, Cappadocia, and Cyprus. It extends southwards as far as Crete and north to the Hungarian border. 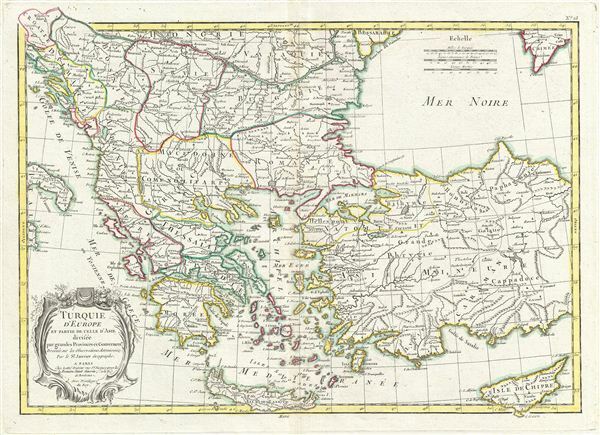 The map includes the modern day countries of Greece, Turkey, Cyprus, Macedonia, Romania, Bulgaria, Albania, Serbia and Bosnia. The Greek Isles are particularly well represented. When this map was drawn this region was dominated by the waning Ottoman hegemony. The Ottomans would nevertheless continue to exert a powerful influence on this region until the early 19th century. A decorative title cartouche appears in the lower left quadrant. Drawn by J. Janvier 1783 for issue as plate no. 23 in Jean Lattre's 1783 issue of the Atlas Moderne. Rumsey 2612.047. Phillips (Atlases) 664. National Maritime Museum, 215. British Libarary (World), col. 384-385 (1762-1785 eds. ).